Looks like sales will edge out April 2012, and possibly come in a bit lower on inventory as well (barring any end of month jumps, although I haven't noticed those recently). 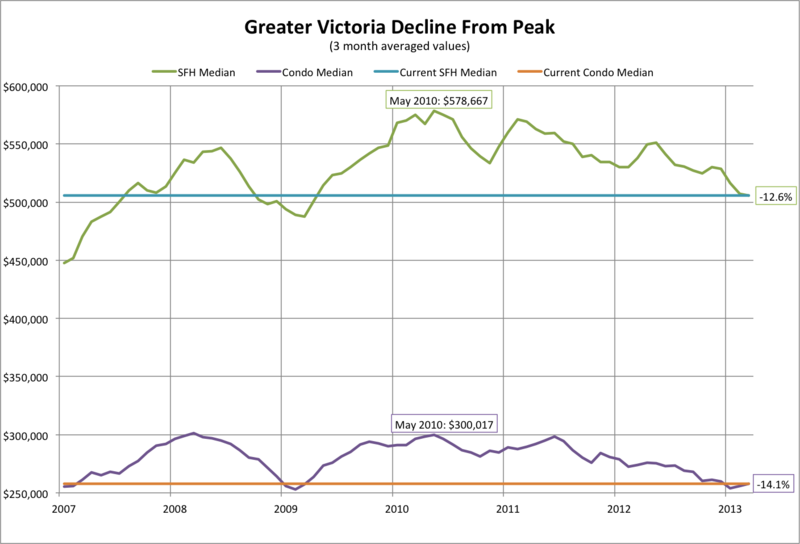 SFH average at $631,000 while the median sits at $540,000. In other news, 4 out of 10 mortgage holders say that adding $20/month to their mortgage payment would impact their finances (whatever that means). How can we make the most expensive areas of the country even more expensive more affordable? Just lend more in the core! I've been playing with it on my iPad and laptop for about 24 hours. Its map-based interface is better than the previous version. Pictures display better too. It's great that it's easy to toggle between map, gallery and list views. Map and gallery are OK, list seems like a very time consuming way to find a house. Anyone else playing with it? Share your thoughts in comments. Relatively strong sales as we've seen, but not overly so. At the same time last year we had 417 sales, so we're certainly not breaking any records. Perhaps it will end up at par with last year +- some small percent. Marko reports the SFH average at $644k, while the median is at $544k. 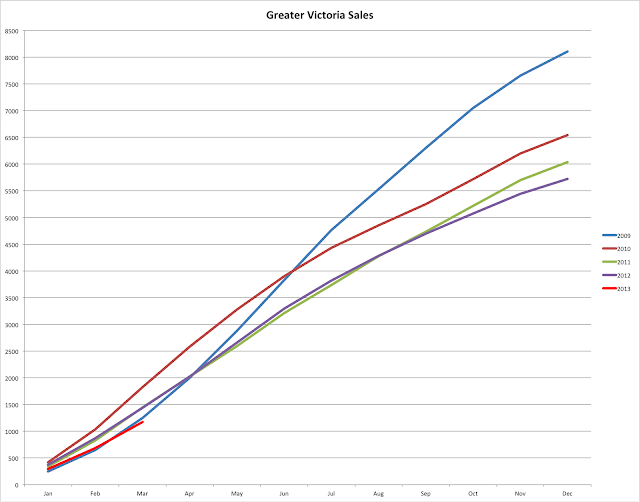 Relatively strong week for sales. This is the first sign of life in the spring market, we are now pretty much bang on the sales pace of last year (265 at this point in the month). As the year progresses we will see fewer big YoY declines in sales because we are hitting months that were already starting to slow last year. When the mortgage restrictions were introduced last July, some lenders predicted that they would take 8-9 months to work through the market, so some of the increase in sales might be due to some of the effects of the mortgage restrictions wearing off. Too early to tell. Wow, north of 250 comments.. Time for an update to hold us until Monday. Quite amazing how few sales there are right now. There were slightly fewer back in the late 90s, but keep in mind the Victoria CMA had 15% fewer people back then. To celebrate the continued existence of the blog, here a VREB-like upbeat take on our March numbers. Marko provides us the early update. Clearly the sunny weather has brought out the buyers last month, with sales exploding by an amazing 22% over February. My friend a realtor says "We're definitely seeing some more traffic at open houses". Meanwhile with interest rates remaining low, it's never been a better time to buy in Victoria. 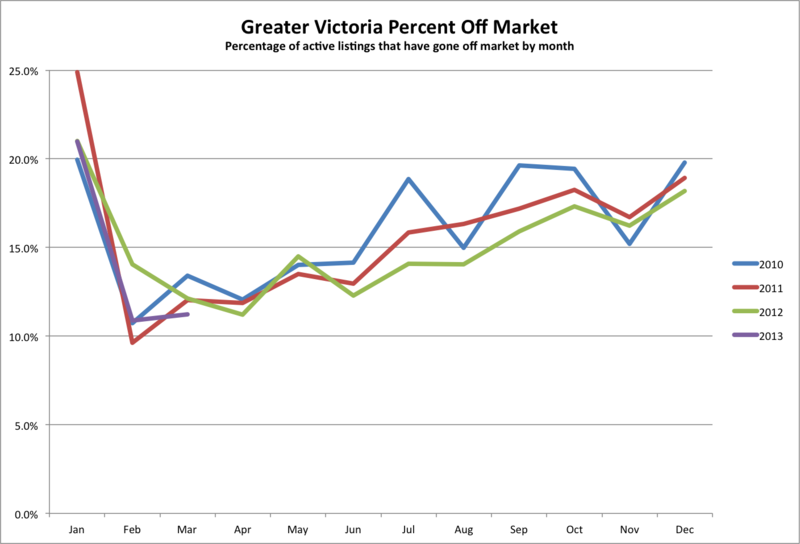 Months of inventory at 9 reflects a balanced market in Victoria. The VREB release is out. "The market continues to unfold as predicted," says Shelley Mann, President of the Board. Hmm... What was that prediction again? 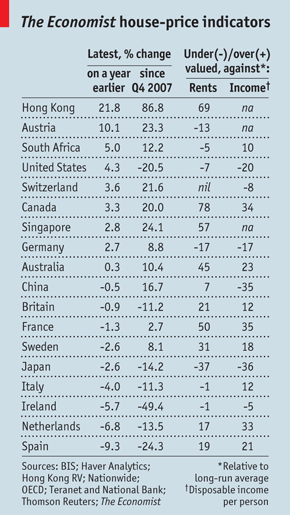 Oh yeah: "sales volume will increase 4% this year over 2012, but prices will remain flat." 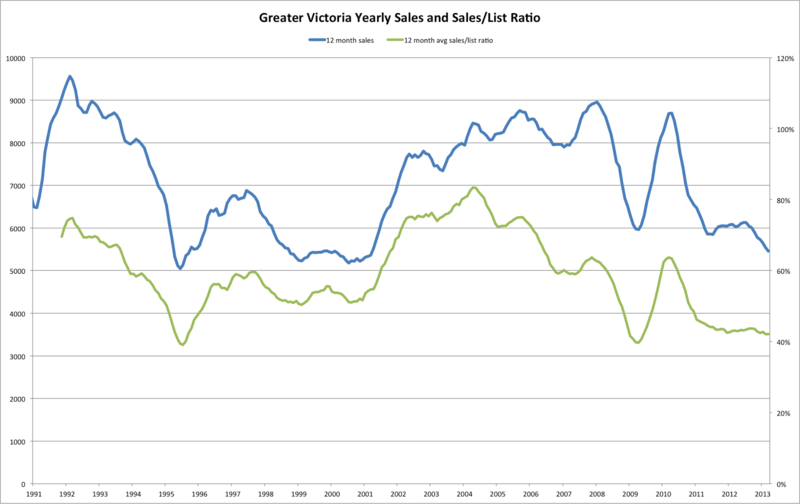 "With sales below the historical norm, there is potential pent-up consumer demand developing in the market. We expect quarterly activity to increase over the next two quarters"
Potential yes. But what's stopping those buyers? If they want to buy there is lots of selection, so I don't see why they don't go out and buy. It seems rather more likely that slow sales will create pent up supply, with people that maybe would have liked to sell last year or the year before for top dollar getting a little more serious. "The first six months of 2012 were reasonably strong, and then mortgage amortization rules changed in July"
This is a bit of revisionist history. The first 6 months of 2012 were pretty weak, and then the year got weaker after July. "With different lending rules in effect, it is challenging to compare the first six months of 2013 with 2012," she adds. The median price of a single-family home is $510,777 compared to $555,000 in March 2012, a decrease of 8%. The six-month average shows a decrease of less than one percent month-over-month. Annual differences are skewed by four single-family home sales over $2 million in March 2012. Sometimes life presents offers you just can’t refuse. So it’s with mixed emotions that I write HHV’s obituary today. All good things must come to an end. The fat lady does sing; it’s true. With the real estate market in BC moving slower than molasses uphill and outside in winter, vested interests are working behind the scenes to protect their potential future real estate lottery wins. A while back I got an email promising cash if I responded. You’ve had a few of them show up in your spam box I’m sure. Typically these emails come from Nigeria. Mine came from Victoria, so it’s legit. It offered boatloads of cash. And it told me the cash was coming electronically via Western Union. The only hook was this blog had to cease to exist. No archives. No new posts. No platform for real estate vendors in Victoria, Australia. Nothing. Zip. Zilch. Nada. HHV has to be no more. Being an individual of curiosity, I read to the bottom of the email to see what I was being offered to shut the blog down. Astronomical! Hailey’s Comet sized cash. Almost enough to buy an Oak Bay blue hair’s 1987 Toyota Corolla with 24,239 kilometers on it from her middle-aged son (still living at home but itching to get his own Oak Bay basement suite, eventually). I took it. Money’s due in my account by 11:59 PM tonight. The blog will shut down at exactly midnight tomorrow as a result. If this makes you angry, I understand. This blog has never been about its creator, it’s always been about the authors and commentators and their ongoing contributions. You’re right to feel like someone made off like a bandit on the backs of your collective efforts. I feel an enormous weight of guilt myself, but the visual of my three hairs blowing in the sunroof wind while cruising in my new-to-me Corolla is easing my pain.I trust MS Excel will help you with yours. Besides, the real culprit in this caper is the organization behind the largesse, I’m just the messenger. Please direct your anger, or maybe your donations, at the Victoria Residential Real Estate Aspiring Flippers Association.